Successfully Added Dual USB Solar Charger - 5600mAh Battery, Portable, Dustproof, Waterproof, Fire Resistant, 8 LED Lights to your Shopping Cart. Charge your gadgets at home, on the go, at a picnic or on a trip into the wild with the portable and reliable Dual USB Solar Charger. Coming with a 5600mAh battery, several levels of protection and 8 LED lights, it’s a perfectly green way to keep your devices charged. This wholesale solar charger comes with a massive 5600mAh battery and a dual USB output. With it, you can easily power up two gadgets at the same time and enjoy faster charging speeds thanks to the 5V output. If you are heading out on a hike or feel like going camping in the mountains, the portable gadget is a true lifesaver. Made for use in rough outdoor conditions, the solar power bank features IP65 rating (totally dustproof and protected against powerful water jets). Thanks to the fire resistant properties, the solar power bank is not easily overheated. That means you don’t have to worry about sudden weather changes or placing the solar charger on the ground. 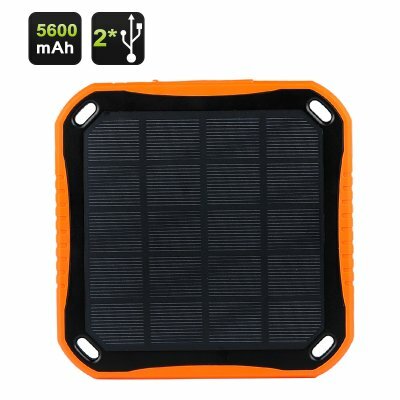 With that said, you can easily hang this cheap dual USB solar charger on a tree or attach it your tent or backpack. The solar power bank comes with 5 LED indicators and 8 LED lights. You will see 4 battery indicators on the side and one that will go on when the power bank is charging. What’s more, you will also have two LED panels on the bottom to help you see the solar charger clearly in the dark. This best Solar Charger comes with 12 months warranty. Brought to you by the leader in electronic devices as well as wholesale solar chargers, Chinavasion..
Exelent Solar Charger equipment, dustproof, waterproof. Good package. Good seller.